I was recently approached by our own Joshlee Dot Com about partaking in a bit of “pole riding” after we finished up a live podcast. It was late in the evening and I was too tired to resist, so I agreed to the activity despite not knowing what it was (Joshlee Dot Com has trusting eyes and he said he’d take care of me so I didn’t feel like I needed to worry). After five minutes of thrusting long smooth poles at each other, I came to the conclusion that pole riding was the perfect end to the evening and even though it wore my hands out, I appreciated being exposed to it. I later found out that there are two very distinct types of pole riding that one can partake in, so hopefully my previous paragraph was telling of the time I had pole riding in the game PoleRiders as opposed to the other type of pole riding that you probably shouldn’t look up if you happen to be at work or church. 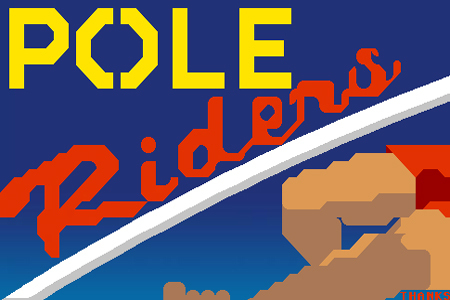 PoleRiders can best be described as a competitive two player game where two men attempt to knock a ball into the other’s goal via pole vaults. Single player is an option, but local multiplayer allows for the best pole riding experience. That’s probably the best description I can hope to give it, but trust me, it’s worth your time.